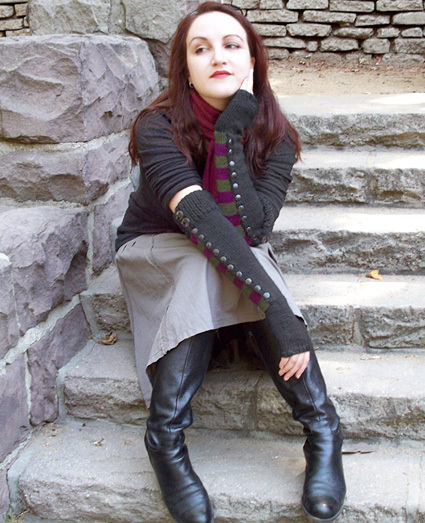 Inspired by the elegance of fall, I combined two of my favorite things to knit (stripes and mitts) to create these fancy snake-bellied gauntlets. Worked from the top down, back and forth to the wrist, these snug-fitting mitts knit up quickly and will keep your arms cozy while you slink through your day or night. Finishing is minimal, but you will need to stabilize your buttons before wearing. Instructions for the method of using additional sew-on buttons as anchors on the wrong side are included in the pattern, and remember: once the buttons are secured you only have to fasten them up once! Note: Measurements are taken with piece unstretched. Wrist will comfortably stretch up to 0.5 inch larger than unstretched measurement; upper forearm will comfortably stretch up to 1.5 inches larger. [Knitty's list of standard abbreviations and techniques can be found here]. M1L (left-leaning increase): Insert left needle, from front to back, under strand of yarn which runs between last stitch on left needle and first stitch on right needle; knit this stitch through back loop. 1 stitch increased. M1R (right-leaning increase): Insert left needle, from back to front, under strand of yarn which runs between last stitch on left needle and first stitch on right needle; knit this stitch through front loop. 1 stitch increased. The Long-Tail Cast On method is recommended for this pattern. Instructions for this method can be found here. If you prefer not to use this method, be sure to use a method which will produce a stretchy CO edge. When beginning with a new color, tie the strand of the new color in a slip knot around the strand of the old color. Slide the knot up close to the needle, then proceed with the new color. Using larger needles and 2 strands MC held together, CO 48[56, 64] sts. Rows 1-3: [P1, k1] to end. These rows set rib pattern for cuff. Row 4 [RS]: P1, k1, yo, k2tog, work in pattern to end. Rows 5-9: Work in pattern. Row 10 [RS]: Work as for Row 4. Rows 11-12: Work in pattern. Row 13 [WS]: Work 24[28, 32] sts in pattern, place marker, work in pattern to end. Break one strand MC and switch to smaller straight needles. You will now begin working in intarsia, slipping marker before changing colors. If desired, remove marker once intarsia pattern is established. Important: Read ahead. Shaping directions and color pattern directions are worked at the same time, beginning on the next row. Work 2 rows in color pattern. Decrease Row [RS]: K to 4 sts before marker, ssk, k4, k2tog, k to end. Work 11[7, 5] rows in pattern. Repeat these 12[8, 6] rows 5[8, 11] times more, then work Decrease Row once more. 34[36, 38] sts. AT THE SAME TIME: Work color pattern and buttonholes as follows. Row 1 [RS]: Using MC, sl 1 purlwise, k to marker; using CC1, k to end. Even-Numbered Rows 2-8 [WS]: Using CC1, p to marker; using MC, p to end. Row 3 [RS]: Using MC, sl 1 purlwise, k1, yo, k2tog, k to marker; using CC1, k to end. Rows 5 & 7 [RS]: Work as for Row 1. When Row 8 is complete, do not break CC1. Carry it loosely along inside of work while working Rows 9-16, catching yarn at WS of work when twisting working colors at join. Rows 9-16: Work as for Rows 1-8, using CC2 instead of CC1. Do not break CC2; carry along inside of work as for CC1 when working next 8 rows. Repeat Rows 1-16 four times more, removing marker on last row. Do not carry CC1 when working last stripe of CC2. Break CC1 and CC2; hand is worked using MC only. Next Row [RS]: Using Needle 1, k4; using Needle 2, k13[14, 15]; using Needle 3, k13[14, 15]; slip last 4 sts to Needle 4. Bring side edge of piece together, then lap sts on Needle 1 in front of sts on Needle 4. [Insert tip of fifth needle knitwise into first st on Needle 1 and Needle 4, k these 2 sts together] 4 times. K all sts on Needles 2 and 3, then k first 2 sts of next needle; this point will now be beginning of round. Redistribute sts between 4 needles, placing split ring marker or safety pin in work at beginning of round if desired. 30[32, 34] sts. Next Round: K1, m1L, k13[14, 15], place marker, m1R, k2, m1L, place marker, k13[14, 15], m1R, k1. 34[36, 38] sts. Increase Round: K to first marker, slip marker, m1R, k to next marker, m1L, slip marker, k to end of round. Repeat these 4 rounds 3 times more. 42[44, 46] sts. Next Round: K to first marker, remove marker, place next 12 sts on waste yarn, remove second marker and join to continue working in the round, k to end of round. 30[32, 34] sts. Repeat this round twice more. Use larger needle to BO all sts in pattern. Divide held sts of thumb between double-point needle and join MC, leaving a 12-inch tail. Join to work in the round. Use yarn tail to sew closed gap at join between thumb and upper hand. Rows 1-3: [K1, p1] to end. These rows set rib pattern for cuff. Row 4 [RS]: Work in pattern to last 4 sts, k1, yo, k2tog, p1. Break both strands MC and switch to smaller straight needles. Work Shaping Directions as for right armwarmer. Row 1 [RS]: Using CC1, k to marker; using MC, k to end. Even-Numbered Rows 2-8 [WS]: Using MC, sl 1 purlwise, p to marker; using CC1, p to end. Row 3 [RS]: Using CC1, k to marker; using MC, k to last 3 sts, yo, k2tog, k1. Break all colors. Hand is worked using MC only. Slip 4 sts to Needle 1; join MC and using Needle 2, k13[14, 15]; using Needle 3, k13[14, 15]; slip last 4 sts to Needle 4. Bring side edge of piece together, then lap sts on Needle 4 in front of sts on Needle 1. [Insert tip of fifth needle knitwise into first st on Needle 4 and Needle 1, k these 2 sts together] 4 times. K all sts on Needles 2 and 3, then k first 2 sts of next needle; this point will now be beginning of round. Redistribute sts between 4 needles, placing split ring marker or safety pin in work at beginning of round if desired. 30[32, 34] sts. Continue working hand as for right armwarmer. 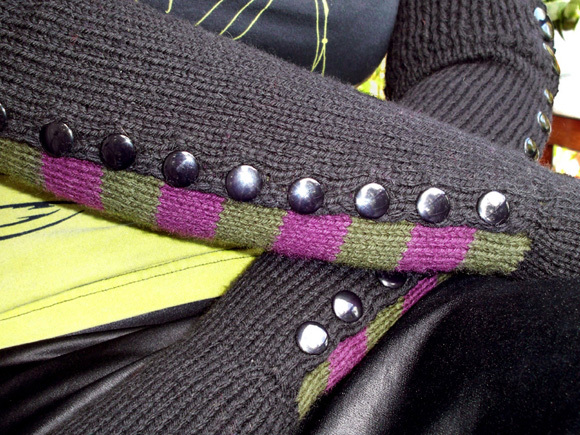 Use pins in place of buttons to close side edges of armwarmers. 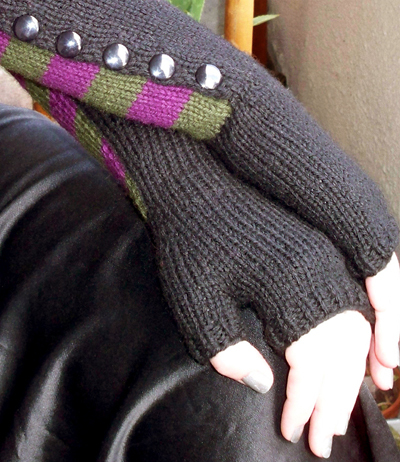 Try on armwarmers to determine best placement of buttons before sewing them on. 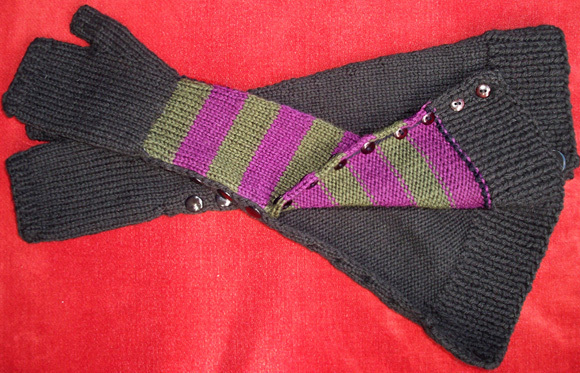 Open armwarmers and mark button placement with pins. Secure yarn to WS of work at button location. Draw yarn up through work to RS, and through hole of shank button. Draw yarn down through work to WS, and through one hole of flat button. Draw yarn through other hole of flat button, back up through work to RS, and through hole of shank button. Repeat this several times, then secure yarn end. Veronica O’Neil is a crafty mom and do-it-yourself fashion advocate living in Los Angeles. Somewhere between teaching her son Andre to be “niiiiice to the doggie” and day dreaming of having a backyard, she maintains a healthy social life and finds plenty of time to knit.